Of all the things your log home should be — sturdy, secluded, fashionably furnished, there’s one element that should never make the list: cold. When it comes to comfort and energy efficiency, today’s timber homes are leading the charge, thanks, in large part, to their used of structural insulated panels (SIPs) to enclose the frame and make it weather tight. We sat down with Stephen Munn, General Manager of Insulspan, a leading structural insulated panel manufacturer, to learn more about the SIPs advantage. THL: How do SIPs work? 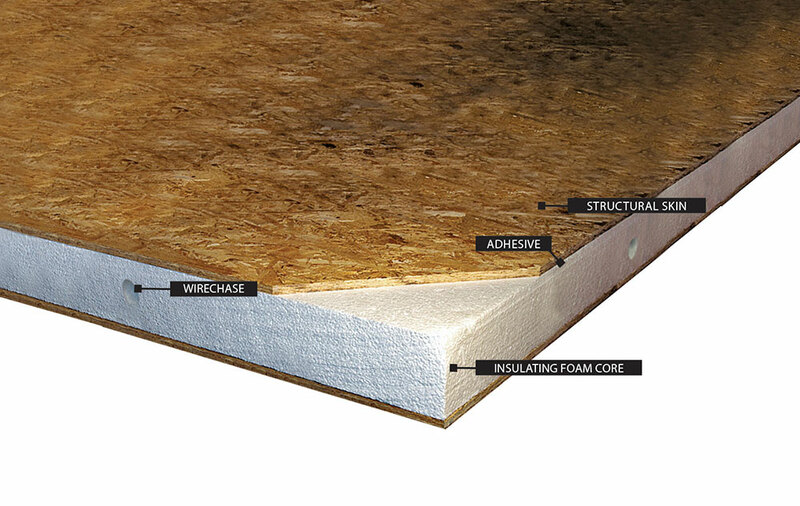 SM: SIPs are created by laminating two pieces of performance-rated OSB2 (rated for structural applications) around a continuous core of EPS (expanded polystyrene) foam insulation. We can provide panel sizes as large as 8-by-24 feet, which allows us to cover a large area with one panel and reduces the number of studs needed for construction. This also reduces heat loss, thermal bridging and air leakage. The other key thing that we do with SIPs is we use a sealant at each of the joints, which diminishes the air flow. You can’t really do that with fiberglass batts or blown-in insulation. THL: How do SIPs compare with other types of insulation? What advantages do they have over the alternatives? SM: Batt insulation has an R-value of 8.8 but with SIPs we can get an effective R-value of around 22.6. A big factor in this is the amount of lumber that goes into creating the wall or roof. Because of the structural aspect of the SIPs, not as much lumber is required. Lumber doesn’t have the same thermal resistance as the SIPs. In regard to spray foam insulation, one of the advantages is we can manufacture SIPs as thick as 12.25 inches, which offers an R-value up to 45. If you really want to increase the R-value, you can add another 20 percent by using a graphite-enhanced EPS foam. You can’t get a spray foam that’s that thick or provides that high of an R-value. The thing is, spray foam is created using a chemical reaction that will off-gas and break down over time, reducing its R-value. The EPS is a rigid, closed-cell foam made of plastic and air, which doesn’t degrade. THL: How much energy can be saved by using SIPs over fiberglass batt insulation? SM: The amount of energy saved would depend on the size of the building. With a 2-by-6 stud wall with R-20 batt insulation, the effective R-value is around 16.8, and with a 6 1/2-inch thick SIP we get an effective R-value of approximately 22.6. But it really depends on the size of the structure and the thickness of the walls or roof surfaces that you’re using. THL: How much do SIPs cost in relation to other products, especially in terms of ROI? SM: SIPs have a slightly higher initial-investment cost, but when you factor in the speed of construction and only needing to have one trade contractor as opposed to two (framing and insulation), buyers actually can save money during the installation process. The real savings, however, is what owners will see over the life of the home. With SIPs, the house requires a smaller HVAC unit because of the higher R-value and the reduced air flow, so equipment costs less. Then you’ll save even more on energy costs over time due to fewer air exchanges. These are the long-term savings that make SIPs worthwhile.